As Feyisa Lilesa of Ethiopia crossed the finish line to win silver in the olympic marathon in Rio, he raised his arms and crossed them above his head in protest against his own government. With this simple act, Lilesa brought the world’s attention to the plight of his Oromo people and the struggle to keep their land out of Ethiopia’s ruling party’s hands. 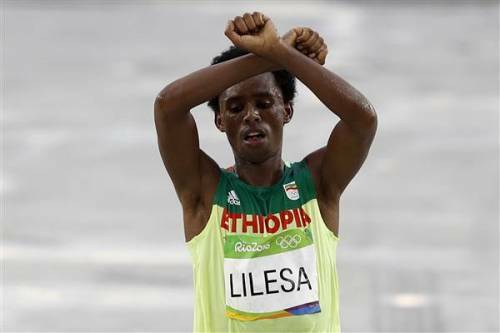 Feyisa Lilesa has etched himself into Olympic protest history and we salute him with the ‘Just Stand Up’ award. But first, I speak with scholar Katrina Karkazis about Caster Sememya. Not only did the South African blaze past all her competitors for gold in the women’s 800 meters, Semenya did so under the most intense media scrutiny, while guarded by an ever-present security detail, and with her sport’s governing bodies, the IOC and IAAF, still governing women’s bodies in invasive and illogical ways. ’Choice Words’ is about the real Olympic drama, which begins now that the games are over. And finally, we hear from listeners who called the Edge of Sports hotline at: (401) 236-3343 (EDGE). This week, we want to know: who was your most iconic athlete or performance of the Rio Games? And why?